Biblical Mount Hermon is the highest peak partially in Israeli territory, while Har Meron is the highest within Israel. 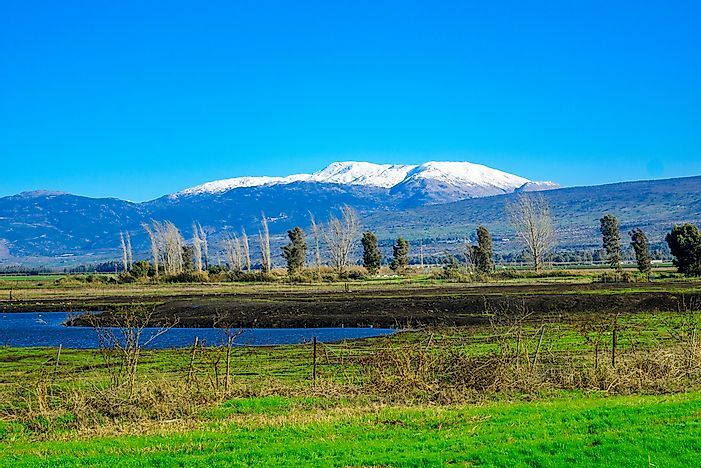 Mount Hermon is the tallest peak that is partially found in Israel. Israel has a number of mountains that are distributed all across the country. A number of them such as Mount Hermon hold much religious and historical significance. It is the highest mountain in Israel with considerable religious and cultural significance. The mountain is 7336 feet. The summit of the mountain traverses the borders of both Syria and Lebanon. The mountain is considered to be a range but with three distinct summits which are approximately the same height. Its height enables it to capture a lot of precipitation in this usually dry region. The mountain descends on the Southern side into Israel up to the Israeli-occupied region of the Golan Heights. It was declared a nature reserve in the December of 1974. The magnificent height of mountains favors the growth and blooming of vegetation starting from August every year instead of spring time. The heights also have significant animals and insects including unique species of butterflies and reptiles such as snakes. The mountain also has an attractive waterfall where Mount Hermon meets the Golan Heights. It is one of the most hiked routes and remains a significant source of attraction to tourists. Banias waterfall is very big attraction to visitors. It is the second-tallest mountain in Israel at 3902 feet. It is the highest point within Israel. Hundreds of thousands of Jews make pilgrimage to the mountain as it is a revered place for the Hebrew Rabbi by the name Simon Bar Yochai. It was declared a nature reserve due to the cultural significance. It snows occasionally on the peaks of the mountain. The climate around the mountain is Mediterranean. It is located in the Negev Desert towards Israel’s border with Egypt. It is 3294 feet making it the highest point in the Southern region of Israel. The mountain is mainly dry with minimal vegetation. It is also next to the well-known Ramon Crater. Mountain climbers tend to frequent the area. It is found in Upper Galilee in the Northern region of Israel. The mountain is 3315 feet making it one of the highest points in the Northern area of Israel. It is widely used for paragliding. On a bright day, the Gilboa Mountains and the Mediterranean Sea are visible from the mountain. It experiences the Mediterranean climate. Most of them are associated with religious festivals as recorded in the sacred books particularly with the Jewish origin. They create a micro climate around them and have been declared natural reserves to protect the unique features which they hold. Most of the mountains serve as important tourist attraction sites.